Information: Lloyd "Pappy" Shaw, author of books about square and round dance. Lloyd moved to Southern California from Denver, Colorado, at the age of two, where his father was in the real estate business. The present site of Hollywood was among his father's holdings, which was lost in the panic of the late 1800s. Nearly destitute, the family returned to Denver when Lloyd was nine. Some two years later, the family moved south to Colorado Springs, where Lloyd finished his formal education. In 1913, upon their graduation from Colorado College, Lloyd married Dorothy Stott. Lloyd then taught biology and sophmore English at Colorado Springs High School. Later, Lloyd served as superintendant of the Broadmoor District's Cheyenne Mountain School on the outskirts of Colorado Springs. There he developed a unique sports program that provided active participaton for the major part of the student body. He developed a championship football team but later barred the sport from the school's curriculum, feeling the competitiveness, acclaim, and ensuing publicity was unhealthy for the school. He then started a program of outdoor activities in which all the students could participate that included hiking, skiing, outdoor camping, and, for a while, horsemanship (which he discontinued because he felt it would launch students into rodeo). He also initiated a program of dramatics and folk dancing. Although square dancing was seemingly dying out in the United States, Henry Ford preserved some of the old dance forms in his Grand Balls at Deerfield Village. Dr. Shaw, ardently pursued his hobby of American square and round dancing, continued searching out, preserving, and revitalizing the dance form. His first out-of-state trip with his wife and their teen-age dance team, the Cheyenne Mountain Dancers, happened in 1937, when he visited Scripps College in Claremont, California. The group then traveled to the National Folk Dance Festival in Washington D.C., in 1939. Following this trip, they made two trips annually, except during the war years. The dancers appeared in more than 50 major cities of the United States. Accompanying the Shaws on these trips, too, was a charming accompanist, Harriet Johnson. It was Dorothy, however, who was always there behind the scenes, supervising the making and care of the costumes, acting as guide and counselor to the young folks, and looking after the hundred-and-one little details that relieved Pappy of many worries. After a few years of working diligently with European folk dancing, Lloyd found that there was a large amount of material among the cowboys of the West. Bit by bit, he uncovered and documented the "American folk dance" of the West, which led to his book Cowboy Dances in 1939. His knowledge and research earned him recognition as the "Dean of American Square Dancing." His research into round dancing brought about his publishing the "Round Dance Book" in 1947. In 1949, the American Academy of Physical Education made one of its rare citations "to the Lloyd Shaw Folk Dance Program, as a noteworthy contribution to physical education." Pappy conducted week-long summer institutes in Colorado Springs, which became the main training center for leaders and callers all over the nation. In addition, the Shaws had a mountain retreat up in back of Pikes Peak that they called "Coombie Corrie," which Pappy designed and constructed almost entirely by himself. They would often take members of their summer classes there, where everyone would consume Dorothy's culinary delights, dance around the massive Swedish fireplace, and listen to Dorothy read some of her poems, many of which were published. His vast knowledge in the field brought Pappy to hollywood as the special dance director for "Duel in the Sun," starring Jennifer Jones, Gregory Peck, Joseph Cotten, and Lionel Barrymore. Pappy died of a stroke in 1958. 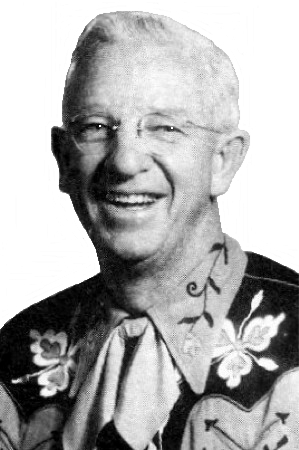 In 1964, the non-profit Lloyd Shaw Foundation was set up to preserve and promote Dr. Shaw's approach to square dancing. This national organization annually supplies callers, cuers, pomoters, and panelists for the National Square Dance Convention. It's major work, however, consists of producing kits of records for school use (including special education, elementary, secondary), recreational use (including contra and one-night-stands), and holding summer and winter workshops to teach instructors and prospective callers how to teach dance. Cowboy Tunes. Shaw, Lloyd. Caldwell, Idaho: Caxton, 1939. The Round Dance Book. Shaw, Lloyd. Caldwell, Idaho: Caxton, 1948. History and instructions for more than 100 American couple dances. 508  Savila se Bela Loza.